The ticks are back in 2014, and it’s a no-doubter. 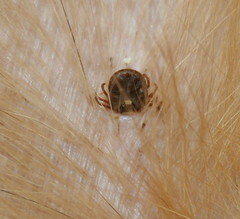 You’d think that ticks would have taken a beating during the winter of 2013-14, but that has simply not been the case. Ticks have an incredible ability to dive and dig below the frost line when it’s cold, and then emerge even during the most brief warm moments and search for a blood meal. When it gets cold again, they move to where it’s safe. Ticks are very controllable, and there are a couple of monthly (and even a 3-month) treatments available that will kill ticks on their host. The best of these treatments are the ones that kill the quickest, as ticks need to be attached for a number of hours before they transmit their diseases. Tick control specifically labeled for dogs should not be used with cats! Pay close attention to product labels and descriptions. We rarely saw ticks in Ohio just five years ago. And often when we did, there was recent travel history with the animal and his/her family. As wildlife has migrated and time has passed, ticks are a very real and present trouble in our area. You don’t have to be in the deep woods to be at risk, either. Our clients have even found ticks in their yards, at sports fields, and in neighborhoods quite a ways from woods and forests. If you see a tick on your pet, you know that ticks have invaded your environment. If this is the case, or you simply want to be proactive, give us a call at 330-929-3223 and we can talk about how to best address the tick risk for your four-legged friend.